So...What's The Angle? Publicitees Graphic tees, tanks and long sleeve tops. Public Relations, Media, Advertising, Marketing, Sales shirts. Write. Pitch! Sleep? Repeat. Publicitees Graphic Tees and Tank Tops. Public Relations, Media, Writers, Freelancer, Blogger, Publicists. I Speak Fluent Media. Publicitees Shirts. Public Relations, Media Graphic T-shirt, Tank Tops and Long Sleeve Shirts. Announcement Share a photo in your Publicitees shirt or with one of our mugs using the hashtag #LovePublicitees, and you can win a gift certificate! Winners will be chosen once a month! Share a photo in your Publicitees shirt or with one of our mugs using the hashtag #LovePublicitees, and you can win a gift certificate! Winners will be chosen once a month! I Break News & Hearts. Publicitees Shirt for Public Relations, Media, Breaking News Graphic tees, tank tops and long sleeve shirts. I Just Wanna Drink Coffee, Rule the World and Sleep. Long sleeve, short sleeve and tank tops! It's Not a Job. It's a Lifestyle. #IWorkInPR. Publicitees Graphic Tee, Tank and Long Sleeve Shirts. Public Relations, Publicist, Publicity. Keep Calm, I'm A Publicist t-shirts, long sleeve shirts and tanks tops. Shhh...I Only Engage Online. Publicitees for Public Relations, Online, Social Media graphic tee, tank tops and long sleeve shirts. 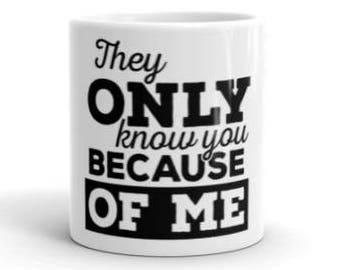 They Only Know You Because of Me. Tank tops, t-shirts and long sleeve graphic top. Post. Pitch! Sleep? Repeat. Coffee is Needed When You're In PR! I asked for a custom design on one of the shirts and it came out perfectly! They look amazing and my team loved them. Thank you! What do publicity and style have in common? It can only be bad when you don't have any! Hi! We are Emily and Sarah - the owners of Mugsy Pr. Wr have done PR and marketing together for a loooong time (longer than we want to admit! ), and over the last five years we formed Mugsy PR. With a roster of global clients, we work HARD at Mugsy with our team, but we definitely needed a fun creative project at the same time, and Publicitees was born. PR and communications in general is a strange, wonderful, secret society type world that we love working in, and we know you do too! Show your PR Pride in black and white with Publicitees! Emily & Sarah are the owners of Mugsy PR and Publicitees. They have been doing PR for almost 20 years, and are excited to share their love of the industry with you in the best way they knew how - through words! All pieces run true to size, but we suggest purchasing the t-shirts a size larger than normal if you are worried as they are slim fit shirts! All of our pieces are machine washable. Our mugs are dishwasher safe. We do however suggest washing the shirts inside out to preserve their print color longer! We do offer gift wrapping and packaging, gift cards and more for an additional fee. Please contact us at info@mugsypr.com for more information.